The squirrel came bounding across the yard and hopped up into the dogwood tree. There two choices awaited it. Should it go for the suet feeder, close to the trunk and easy to hold onto? Or would it be sunflower seeds today? That would involve a little more work, some gymnastics, and perhaps, a bit of luck. The squirrel sat there on the branch, seemingly deep in thought. Then it pattered out on the branch holding the seed feeder. Another stop to think. A junco watched as the squirrel started down the wire to the feeder, then pulled back up. Was it worth it? For a moment, it pondered strategy. Then it tried again, slipping down the wire, back feet tightly grasping the branch above, hanging upside down next to the feeder. 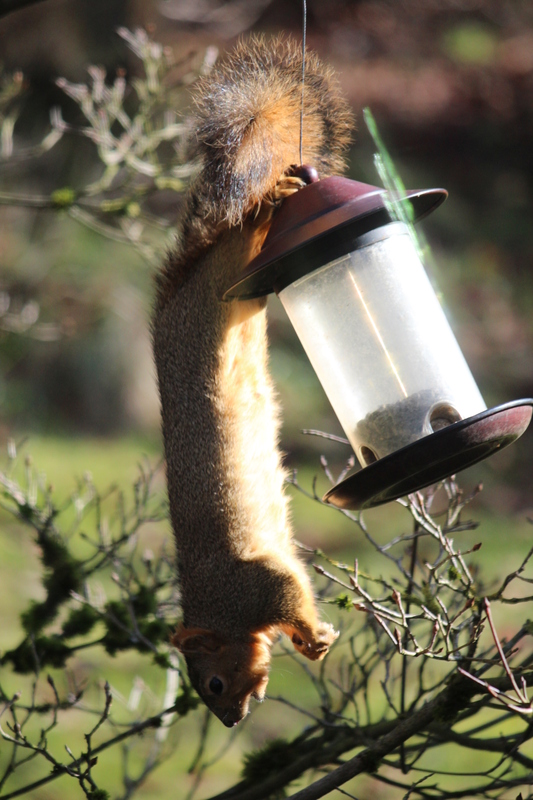 It carefully slid down the wire until the back feet held onto the top of the feeder. Finally it could reach the seeds. Front paws grabbed the feeder, picking out little black nuggets. It ate a couple, reached back for more. Oops! Back feet slipped, and down went the squirrel. It plopped to the ground, dignity injured, but otherwise apparently unhurt. Okay, maybe it would just eat seeds off the ground for a bit, take the safe route. But keeping a squirrel out of a tree is like keeping politicians off the stage. Not going to happen. Soon, confidence recovered, the furry guy was up there again, plotting its way to dinner. I love to watch the birds at the feeders outside my window. Each species has its own personality. The Steller’s jays sweep grandly in and dominate—until a flicker shows up and chases the jays from the feeder. The starlings come in noisy hordes, the bushtits in friendly little flocks. 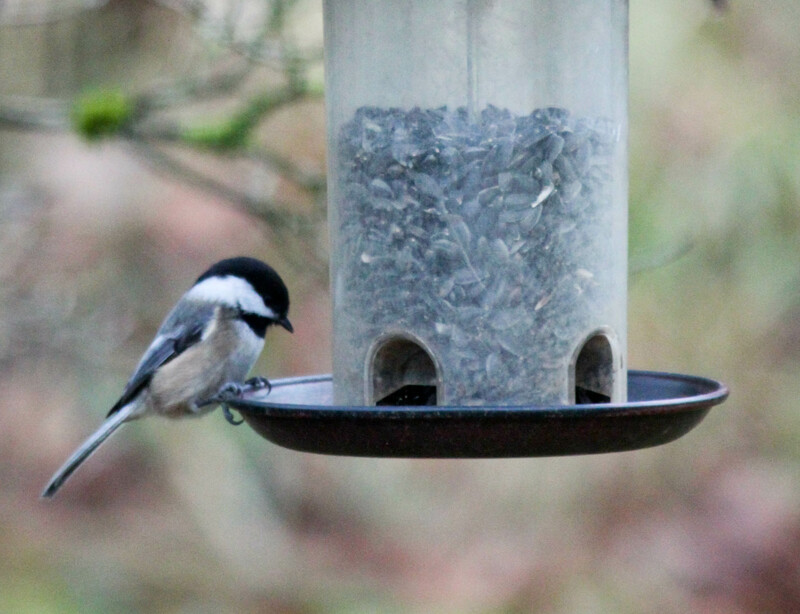 The chickadees are especially friendly and easy-going. The chestnut-backed seem a bit friendlier than the black-capped, but neither is particularly shy. They can get a bit demanding when I don’t keep up with my feeding chores. But when the feeder is filled with good, black oil sunflowers, the chickadees flit about in the dogwood tree where the feeder hangs. 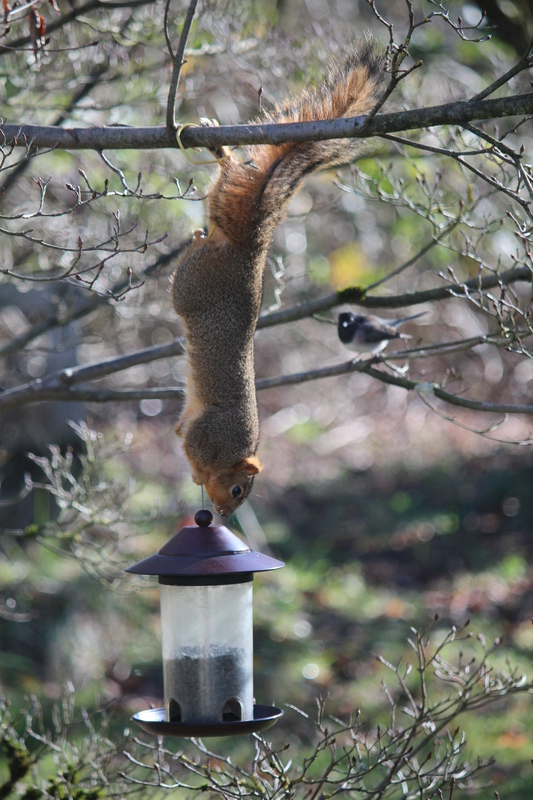 One will zip in, grab a seed, and fly to a perch nearby to eat it. Then another swoops in. They patiently take turns, each picking up a single seed and eating it before coming back for more. 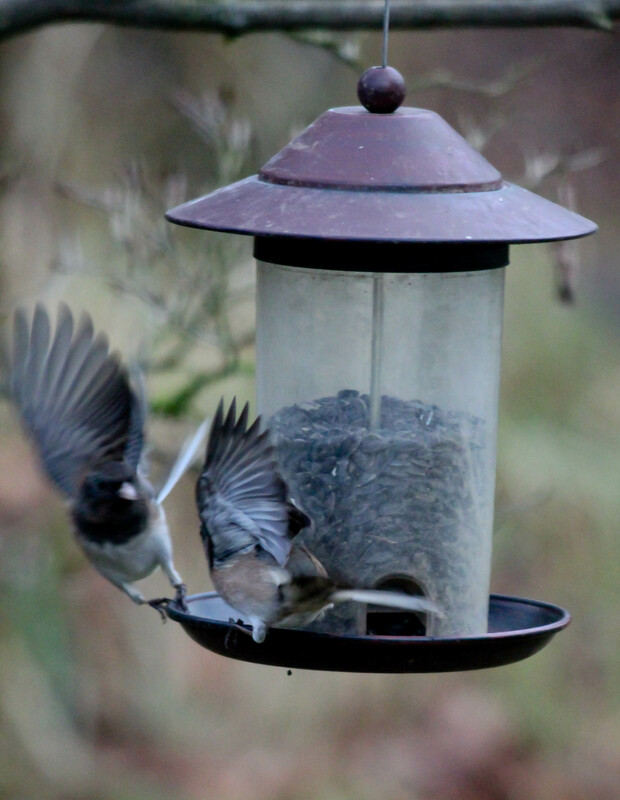 Occasionally two or three will land on the feeder at the same time, but no one gets pushy. The juncos aren’t quite so obliging. They don’t like to share the feeder, particularly with other species. They flap their wings at interlopers and seemed annoyed that others would want to move in while they are eating. Still they are models of courtesy compared to starlings. Starlings will share if they have to, but you can’t make them like it. 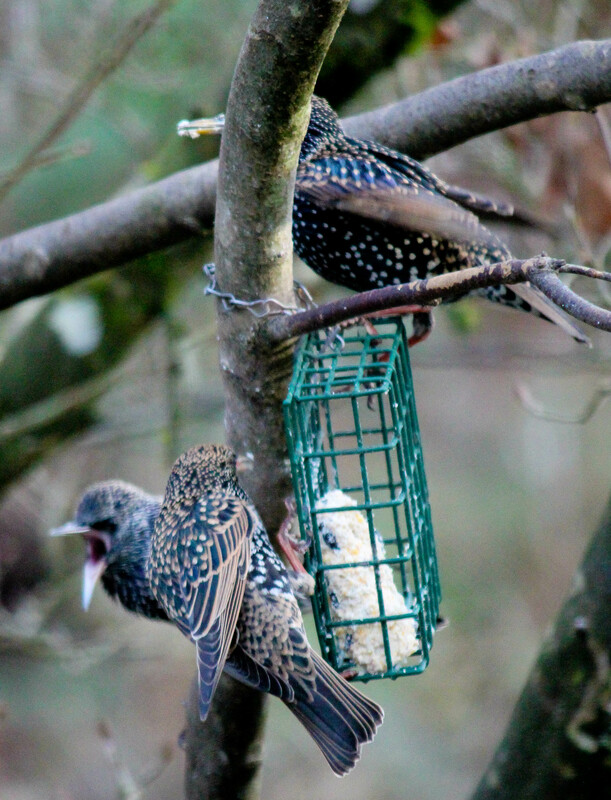 They squawk and flap about on the suet feeder, greedily grabbing big mouthfuls of food. 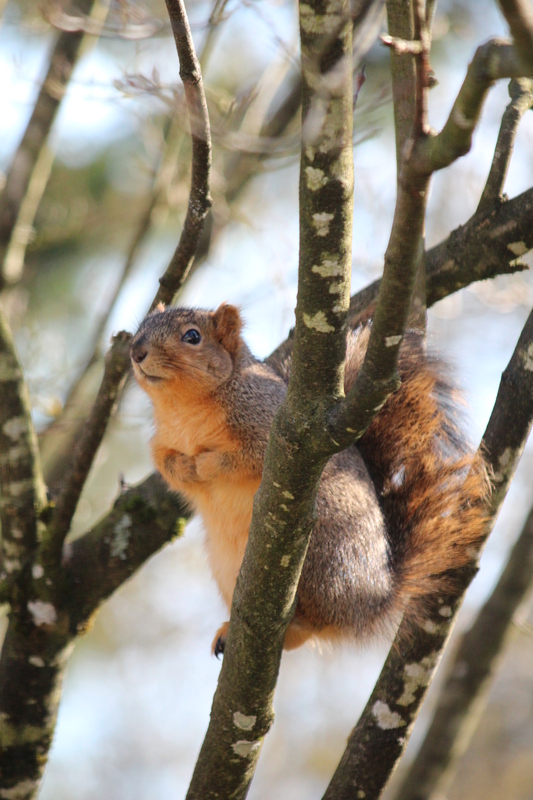 However, for a true show of dominance, the squirrel is definitely tops. 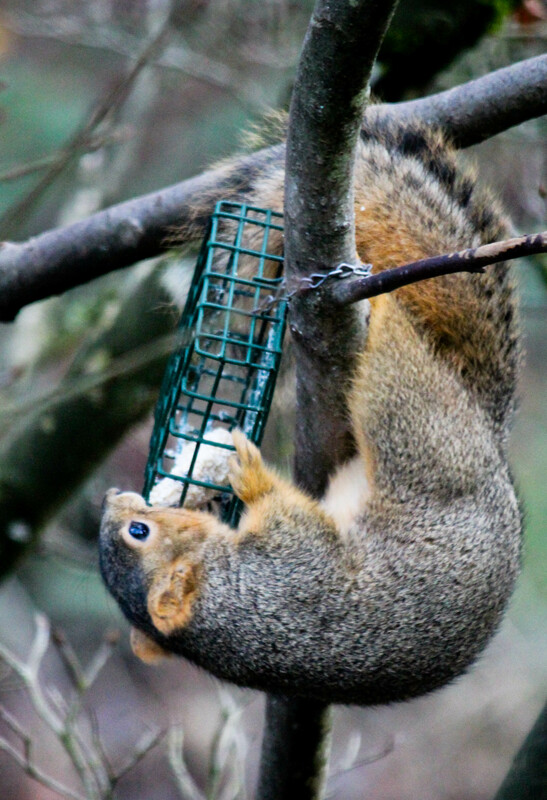 He’ll hang by his tail over the seed feeder, gobbling down as much as he can before he loses his grip on the branch above and has to drop off. Or curl his well-fed body around the suet feeder so no bird has a chance of sneaking in. 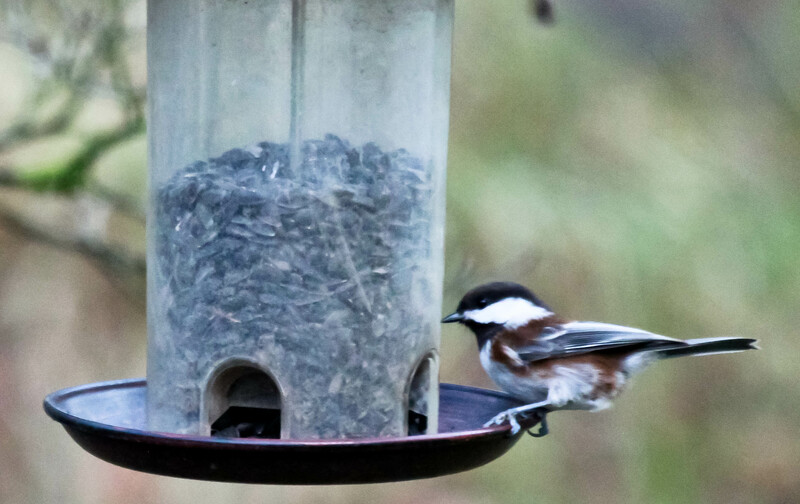 And meanwhile the polite little chickadees eat their seeds one at a time, cheerfully sharing and enjoying life, one moment at a time. 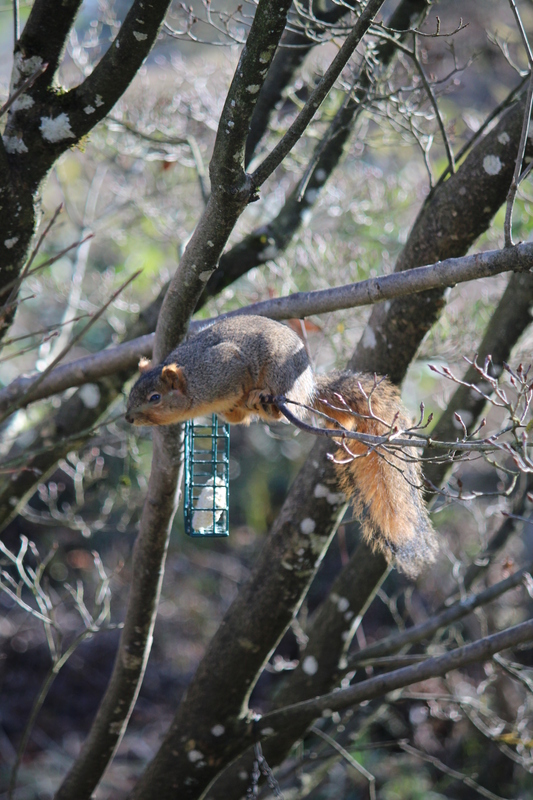 Squirrels can be a nuisance at times—knocking food out of the bird feeders and gobbling it down before the poor little birds get a chance. However, they can also be pretty amazing to watch. 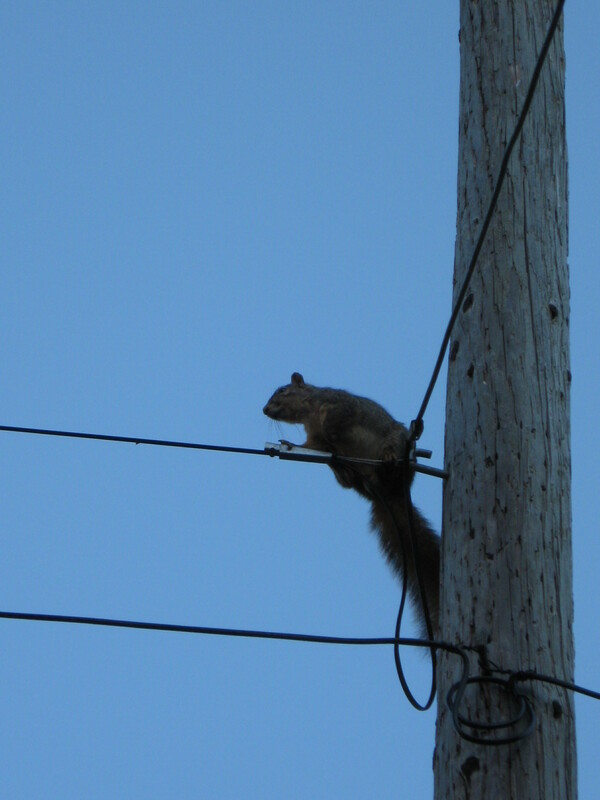 Today’s squirrel first appeared running along the phone wire from our house. How it kept its balance on such a thin line I don’t know, but it appeared quite at ease on the high wire. 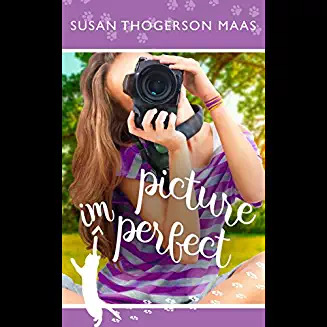 It stopped as it reached the kousa dogwood brimming with ripe, red fruit. 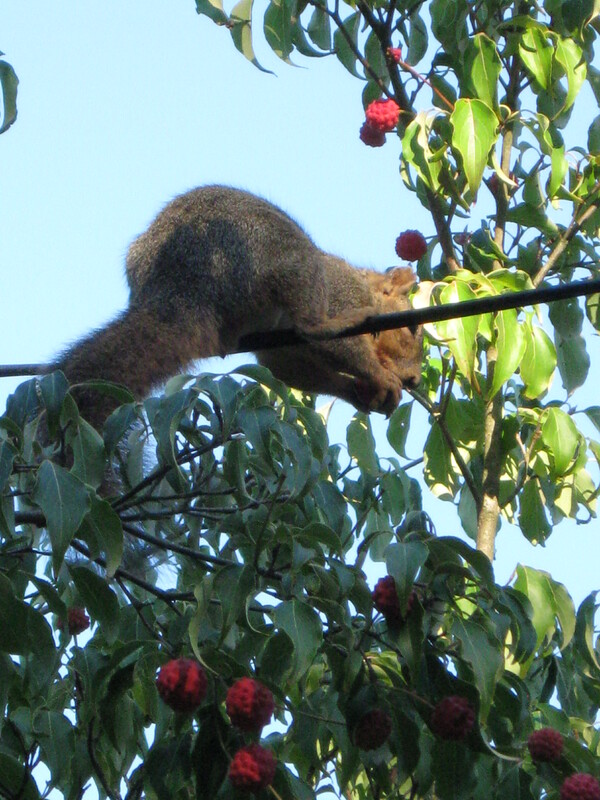 After munching on the juicy dogwood fruit, still balanced on that narrow wire, it was ready for a snack of sunflower seeds. We try to hang out feeders where birds will at least have a fighting chance for the seeds. 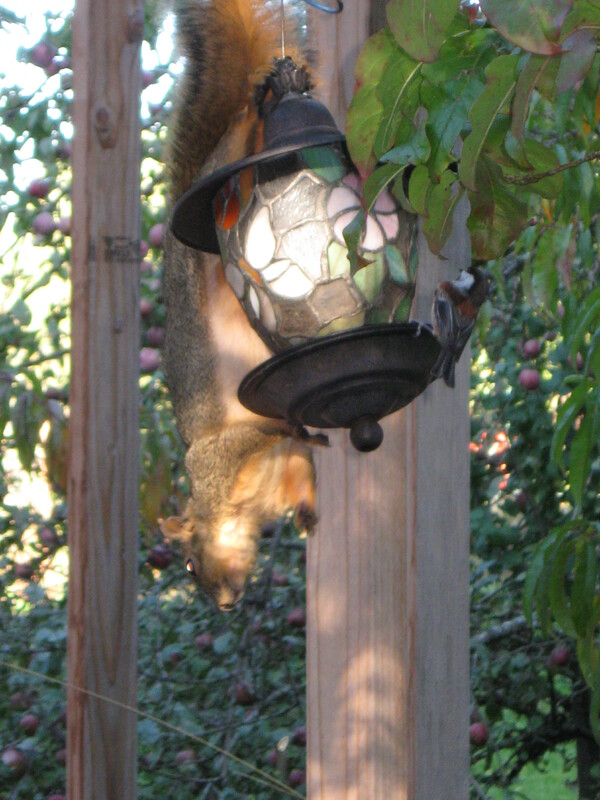 However, those limber squirrels have no trouble getting all they want, even if it means hanging upside down to eat. A couple chestnut-backed chickadees attempted to join the squirrel for supper, but didn’t seem too comfortable with the tilting table. After several minutes of sunflower seed chomping, our friendly neighborhood squirrel needed a rest. Up the light pole, it scooted, easy as strolling down the street. Perched serenely on a wire high up the pole, the critter surveyed its domain contentedly. Below, robins pecked at dogwood fruits and chickadees zipped to and from the feeders, enjoying the short respite our lordly squirrel deigned to allow—because we all know who controls the feeders. Anybody have any good squirrel tales to tell?